This Villiger Talanga Robusto was another cigar included in last month's Cigar Of The Month package from Cigar Train. Covered with a silky smooth, Claro colored Talanga Honduran wrapper, this robusto has a nice visual appeal. Not only was the wrapper put on with seamless care, it's oily and practically vein free. 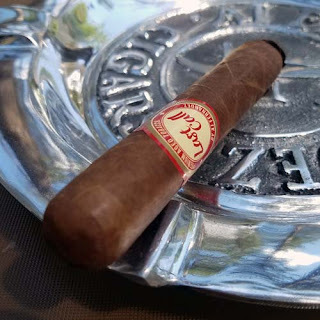 The cigar is packed well full length and it topped with a nice triple cap. From the cold foot there is a mild aroma of toast and the free draw tastes like sweet sugary cream. After clipping the cap and lighting up, the first mild bodied puffs tasted like toasted cashews with a hint of mild spicy cedar. Around the mid point, the spice turned to hot red pepper for a few puffs then mellowed out again. There were other second half flavors of earth, leather and brown sugar. After fifty-five minutes the Villiger Talanga Robusto finished with a nice mix of cream and leather. Overall, this was a nice cigar. It had top notch construction, a great burn and a balanced flavor mix. Try it out, it's a nice cigar.